Portlandian indie-pop band Wild Ones performing live at Maison, Costa Mesa, CA. 3/13/2015. If you’re anything like me and crave to find some inspiration with live music some days, there’s a new Costa Mesa music venue that will make it easy for you to drop in on a Friday night for a small show at only $10 bucks. But, the brand new music venue called Maison, located on 719 W. 19th St, has been caught in a grind. Last Friday the 13th, I walked up to the makeshift music venue — at the time with a music poster pasted on top of its old name — to be greeted by a pleasant ticket-handler and security guy. I was looking to see the up-and-coming indie-pop band, Wild Ones from Portland, Oregon. I walked into the swanky, one-door entrance and walked down a dimly lit ramp. There was a small dance floor with the stage directly in front of it, with a closed-off restaurant-style seating in the back and bar area to its side. Unknown to the band and many other guests at the time, they had not known that the new Costa Mesa bar and nightclub didn’t even have official permission to be a nightclub music venue, or business, in the first place. Neighborhood resident Stephen Chan brought the venue to the attention of city officials in early March once he recognized that the site was being used as a new LiveNation entertainment venue and nightclub, instead of just its permitted bar. Costa Mesa’s Building Official Khanh Nguyen and other representatives from the Costa Mesa Fire Department arrived on-site Friday, March 20 to inspect the place. City officials found numbers of safety issues with the venue, such as a a single entry and exit door instead of two, a missing knob on a restroom door, tripping hazards, no exit signs and an unfinished floor. Fire Chief Dan Stefano also said on Friday that he had concerns related to fire and life safety issues, such as the club’s lack of lighting and an emergency egress plan. At about 6 p.m. that Friday, city officials red-tagged Maison and placed an immediate closure on the club until owner Roland Barrera agreed to comply with all of the necessary permits, inspections and building codes necessary for operation. Nguyen told “The Daily Pilot” that Barrera will be fined on the unpermitted work his crew had done on the venue thus far, which could be up to $1,000. Owner Barrera, who also owns the speakeasy bar Casa, near Maison, seems to have been caught in a number of unscrupulous activities. In 2013, it was reported that Barrera was named as a suspect in a federal Ponzi scheme. And, Barrera’s company, The SUN Grp LLC, was involved in Costa Mesa’s troubling 60th anniversary party in 2013, was paid a questionable $120,000 for entertainment. With four bands having already performed at the venue since the beginning of March and several other bands booked through May, Maison has had to stop its current bookings until they can secure future operations. 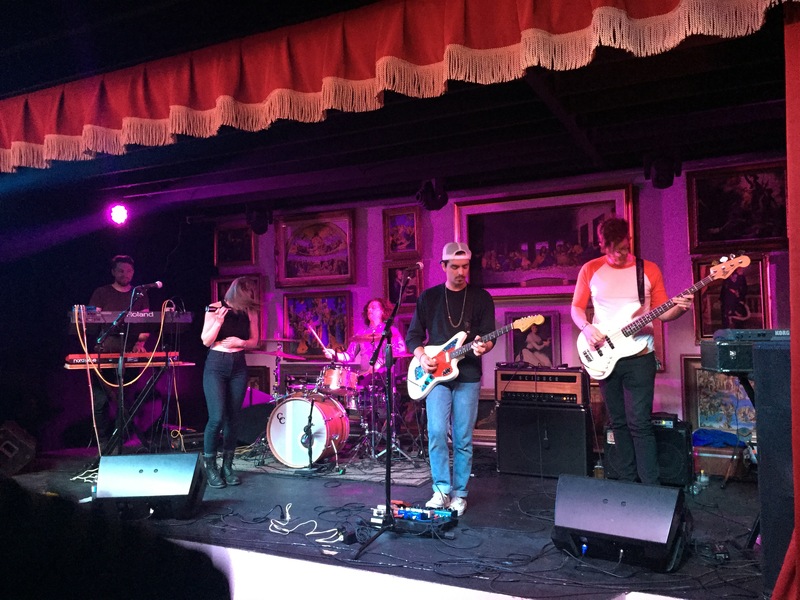 Orange County isn’t necessarily the first destination you’d think of for finding a vibrant music scene; but, its underground independent scene is something to look out for — and there always seems to be something fishy going on. Let’s just hope this cool little up-and-coming restaurant-lounge venue can figure itself out before supporting small acts and having guests in an unsafe space. Orange County band POP NOIR performing live at Maison, Costa Mesa, CA. 3/13/2015. Bar area at Maison, Costa Mesa, CA. 3/13/2015.